If you’ve ever passed by a renovation or construction site, you’ve probably noticed the dumpsters crammed full of drywall, two-by-fours, metal, glass, plastic and other waste materials. But have you ever wondered where those materials go? Too often, it’s the landfill. For the past 40 years, Richard S. Burns and Company has made it their mission to change that. Founded as a one-man operation in the 1960s, the company now operates a 10-acre state-of-the-art processing facility in Northeast Philadelphia, transforming demolition and renovation waste into reusable materials. Burns’ efficient and surprisingly clean facility handles over 1,500 tons of material waste per day and diverts between 85 and 90 percent of incoming waste away from landfills. 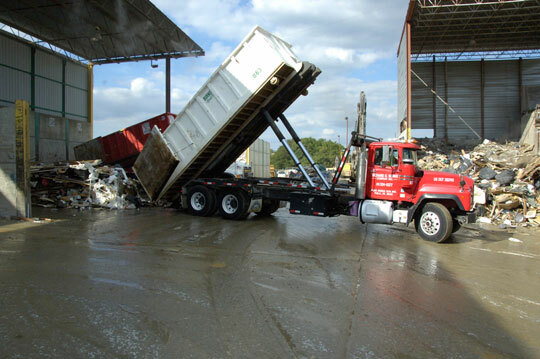 For contractors and renovators in the Greater Philadelphia region, Burns provides dumpster rentals, same-day waste removal and recycling of all non-hazardous waste material. Their two LEED-accredited project managers work with businesses and construction sites to develop earth-friendly waste management plans. The magic begins when the dumpsters arrive at Burns’ facilities, filled with rubble and other demolition waste. After each load of materials is photographed, weighed and given an identification number, it is sorted on a magnetic conveyer belt. Metal, gypsum, stone, cardboard, glass, porcelain and plastic materials are separated for recycling. Wood is chipped into mulch or sold to landfills as a proprietary barrier system. Stone is crushed and screened for drainage, road-building and landscaping applications. Asphalt roofing shingles are ground for use as additives in the manufacture of both road and roofing asphalt products. With materials that cannot be reused in their current form — for instance plywood, contaminated cardboard and window glass — Burns makes its patented Barrier cover product for landfills, which the company sees as a necessary evil, but one that should be as environmentally sustainable as possible. In Pennsylvania, New Jersey and Delaware, Barrier has been tested and approved as an alternative to the six inches of non-reusable soil typically required as daily cover for landfills. Because of the large amount of soil it replaces on landfills, it meets the highest standards of environmental protection and is compliant with existing LEED guidelines. To find out more, visit: burnscompany.net.